Chocolate is serious business in France. Paris is arguably the hub of French chocolatiers—and sheer heaven for chocolate lovers. There are many boutiques run by world-class chocolatiers in the City of Light that should not be missed by sweets connoisseurs. 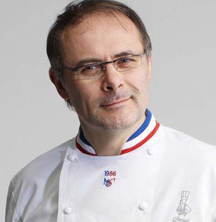 And near the top of that list is the mini-chain of shops operated by MOF chocolatier Jean-Paul Hevin. Hevin began experimenting with pastry baking and chocolate making at age 13, and even by his late teens wasn’t considering a career in the field: He had intended to be an electrical engineer, but (fortunately for us!) missed the university application deadlines. So, at age 17 and facing an uncertain future, he opted instead to study chocolate making and enrolled in the Robert Buron technical school in Laval, France. The rest is chocolate history! Hevin earned his vocational certificate in 1974 and soon was working as an apprentice confectioner at Paris’s prestigious InterContinental Hotel. In 1976 he was hired at the equally esteemed Nikko Hotel and eventually rose to the rank of head pastry chef, a role that he filled until the late 1980s. In 1988, Hevin left the hospitality industry to open his own chocolate shop–which he dubbed “Le Petit Boule (the Small Ball)”–in Paris’s tony 7th Arrondissement near Invalides and the shopping street Rue Cler. Not unexpectedly, the boutique was a huge hit. He eventually opened two more Paris boutiques plus a tea house (my favorite of his shops is the Rue Vavin boutique near the Luxembourg Gardens on the Left Bank), as well as boutiques and chocolate-themed bars in Hong Kong, Shanghai, Tokyo and Taiwan. Over the years, Hevin has racked up quite a few professional accolades, including winning first prize at the 1982 French Cup of Pastry, snagging first prize at the 1984 World Chocolate Master competition, earning the 1986 title of Best French Workman in Pastry and Confectionery, being named the top chocolate maker in Japan in 2004 and winning Paris’s 2005 Best Macaron competition. Hevin’s boutiques offer traditional bite-sized chocolates, ganaches, pralines and truffles, as well as chocolate bars, macaron cookies, a variety of chocolate-based pastries and other sweets, like candied fruit, chocolate-covered almonds and more. Specifically, Hevin offers chocolate from virtually every cocoa-producing nation on the planet, including products from Peru, Madagascar, Venezuela, Cuba, Ecuador, Colombia, Haiti, Java, Ghana, Sao Tome, Principe and Trinidad. 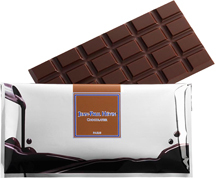 These products—most notably the shop’s chocolate bars—are clearly marked as to the national origin of the cocoa beans, allowing chocolate connoisseurs to zero in on products from new or favorite producers. And like most artisan chocolatiers, Hevin offers confections in both traditional and avant-garde flavors. 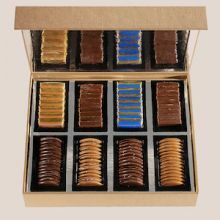 Some of the more unusual offerings including ganache with Earl Grey or green tea; ganache with three types of honey; lime-flavored ganache; dark chocolate with grapefruit zest; dark chocolate with figs; and candied ginger coated in chocolate. Hevin’s award-winning macarons come in such flavors as crème brulee, fig, passion fruit, mango with coriander and several varieties of chocolate, including cookies made specifically from chocolate produced by each of the world’s cocoa-growing country. All four of Hevin’s Paris boutiques are open from 10 a.m. to 7:30 p.m. Tuesday-Saturday (closed Sunday and Monday), which a counter selling Hevin products in the renowned Lafayette Gourmet shop inside the massive Galeries Lafayette department store on Boulevard Haussmann in the 9th Arrondissement is open from 8:30 a.m. to 9:30 p.m. Monday-Tuesday and Thursday-Saturday, and from 8 a.m. to 9:30 p.m. Wednesday (closed Sunday). This entry was posted in Candy Shops, Food and tagged chocolate, chocolatiers, Jean-Paul Hevin by Bob Adams. Bookmark the permalink.